Newlyweds, families and school tours have flocked to the sea side resort town of Cox's Bazar for decades in pursuit of sun, sea and sand. Bangladesh's government has ambitious plans to boost the country's tourism revenue by up to $5 billion (Tk 40,000 crore) over the next 10 years. Cox's Bazar's 125km of unbroken sandy coastline, the world's longest natural beach, is a large part in achieving that goal. 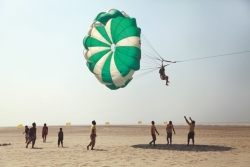 the Star visited the Bangladeshi holidaymaker's destination of choice, and found, while charming and picturesque, Cox's Bazar has a lot of domestic travellers' needs to address before it can really compete with beach destinations abroad for more foreign visitors.